This morning we broke our rain duck and set off in the drizzle. We'd had an interesting night, and it wasn't like we could get much wetter. We'd woken up at 1am to find that the waterproofing on our tent ground sheet had failed for the first time in our experience. Wherever there was anything pressing on it, water was coming through. To be fair to it, at this point we were pretty much camped in the middle of a small lake, so it wasn't really surprising - most of the footprint in the porch area had a small river running through it. We discussed our options and went for the, let's just sleep on the thermorests without any bedding option and use our waterproofs for pillows. Everything else went into ortlieb panniers and the dry bag. The thunderstorm overhead with accompanying torrential rain made no signs that it would like to move on, and neither of us wanted to go outside in the rain. Surprisingly, it worked. By 6am, Joth had started to get a little cold as his mat was waterlogged, but we had both got more sleep than expected. It had started raining heavily at 7pm last night and while it was still raining at 10am, it was much lighter. Up until today the only rain we've seen was heavy showers, but over fairly quickly. The weather had clearly been lulling us into a false sense in security. This is Colombia's rainy season after all. The restaurant at the campsite didn't open until 8am, so we opted to get a few km of climb in before breakfast. We stopped at a small deserted cafe a few km up the road for a traditional breakfast. Two minutes after we sat down a number of trucks turned up with their drivers all sitting down for their regular breakfast. We've not done so well for choosing places to eat over the last couple of days, but we seem to be getting the hang of it at last. We've been finding it difficult to spot places which are open and actually serving hot food. 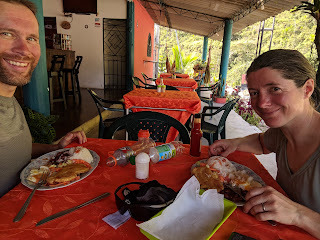 We managed a traditional lunch today too for a change: soup followed by meat, fish or eggs served with rice, vegetables, plantain, beans and sometimes potato or cavassa. Colombians traditionally eat a large breakfast, a large late lunch and a small evening meal. Trying to get a full meal in the evening can sometimes be difficult and get you some strange looks. Unusually, the truck stop hospedaje we are staying in tonight do serve a full meal in the evening, though we managed to resist it. Today has been full of climbing. We've had a fair amount of descending too but we won't be dropping below 1000m above sea level again for several days. This is a good thing, as we both find the heat and humidity a challenge at the lower altitudes. 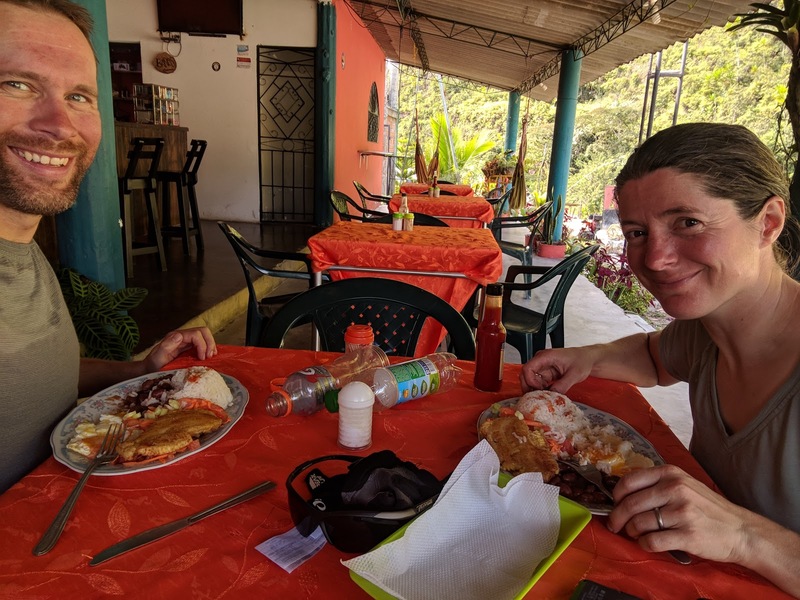 We've spent all day on the Pan-American highway. The views are splendid, but the traffic and disappearing shoulder make things challenging sometimes. There are a lot of very slow trucks on the climbs, and busses and other trucks frequently overtake when they don't have visibility. Twice today we've seen traffic in one lane grind to a halt as an overtaking vehicle has come nose to nose with oncoming vehicles. In general the traffic is very courteous when passing, there have been a few close passes when a truck is overtaking a truck who is overtaking us. There isn't much spare room on the road in that situation. Tomorrow we'll continue on up the Pan-American highway to the plateau on which Medellín is situated.